For those who get that error like me. Actually, That means that you are missing a “comma” in your SOQL query. I know, Crappy SQOL parser message, but wake up and keep coding! This entry was posted in Apex Tip and tagged apex, soql on 2015/03/13 by martin. In short: This is a new SFDC feature to retrieve and show data in SFDC without save it in the platform. External Data Source: Connection to external service to retrieve data on the fly and show it in SFDC. It could be OData 2,0 or URL Rest. External Object: New type of Custom object which works as a wrapper to expose external data. When you have to integrate a service that support OData 2.0. When you are planning just ReadOnly integration. When you need that data in SFDC just to be rendered and not to be calculated (what I mean is to use it in a workflow process). This is partially true depending on your intentions when accessing this data thought APEX. It is always possible to add a proxy service to translate any source to OData. Jitterbit and other services support it. High Data Volume checkbox bypassed most of limits. The authentication could be: Anonymous, Per User o Unique. Oauth 2.0 or Password. Take in mind that this feature will require a special licence. External Objects are not available for: reporting or workflows. External Objects are READ-ONLY (I hope this would change soon since OData is Full CRUD supported). Performance could be affected by the external load. Latency would be poor in some cases. There are a limit of queries to be executed by hour. This entry was posted in Force.com and tagged External Data Source, External Objects, Integration, Ligthing Connector, OData 2, What is it on 2015/02/24 by martin. If you have a basic knowledge about mobile UX, you would know that it is quite important to improve the functionality for mobile in order to improve the performance, visualisation and other device implications. Having said that, our first approach as Salesforce developers is to minify the amount of fields, related lists and also some specific functionality in the standard page layout. In the second case Salesforce does not allow you to set an specify Visualforce page for each platform frontend: Salesforce1(mobile) or FullSite (Desktop). Set the standard action (View for instance) pointing your Desktop Visualforce page. Set to false the mobile availability checkbox in that VF page. Create the second (mobile friendly) Visualforce page. Be sure that you are using a standard controller if you consider to override Edit/View actions. Create a Publisher Action pointing your new VF page. This entry was posted in Apex Tip and tagged Salesforce1, visualforce on 2015/02/22 by martin. If you are working to adapt or create a Visualforce page for Salesforce 1, you would know that you need to detect what type of client application (mobile or desktop) is doing the request. I’ve been notice that “Person Account” is the label description and not the developer name of the Record Type. Having said that if you work in a multi-lang org, You’ll need to make a Query. This entry was posted in Apex Tip and tagged apex, recordtype, Salesforce on 2014/06/08 by martin. 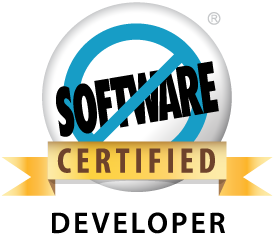 Salesforce Certification Tip: How to get Salesforce Developer Certification (DEV-401) studying only 12 hours ? What to study to pass the certification exam? There is a LOT of good resources to study in order to get the Developer Certification (aka DEV-401). Well, I my opinion if you have a good previous experience working on the platform, let’s say more than 6 months, you don’t need to study too much to pass the exam. Having said that, If you focus the main points to be asked during the exam I believe you could success investing only 12 hours of study. Force Platform Fundamentals: This is the main resource. The exam is based mostly in questions formed with samples from this book. This book explains the main features of Force.com Platform guiding over an use case called “Universal Recruitment”. Here I’ll review every non-coding developer feature like: Custom Objects, Relations, Fields, Page layouts, Security, Roles, Profiles, Applications, Views, etc, etc. If those concepts are not new for you, you will complete it in less than 8h. Summary: There is plenty of good summaries but this is awesome. Simple, short and extend enough. This excellent post will give you a clear idea of the main limits and amounts that is good to remember. Besides the precise components definitions. As I said, if you have previous experience in force.com and a good technical background from my point of view you can pass the Developer Certification exam just studying well those resources. This entry was posted in Apex Tip and tagged Certification, DEV-401, Saleforce, tip on 2014/05/18 by martin. If you worked with Salesforce Knowledge Base Articles in Apex, I would know that so many objects and restrictions that make that feature really difficult to rich a deep customization. Article Type__DataCategorySelection Object A data category selection represents a data category that classifies an article. Article Type__ka Object Gives access to an article from a specific article type independent of its version. This object is read–only and can’t be used in a SOQL clause or in a WITH DATA CATEGORY DataCategorySpec SOSL clause. For more information, see KnowledgeArticle. Article Type__kav Object Gives access to all articles from a specific article type depending on their version. This object gives access to the fields available in KnowledgeArticleVersion. For more information, see KnowledgeArticleVersion. Article Type__Feed Object Represents a single feed item in the feed displayed on the detail page for an article. Article Type__ViewStat Object Provides statistics on the number of views for an article from a specific article type. For more information, see KnowledgeArticleViewStat. Article Type__VoteStat Object Provides the weighted rating for an article from a specific article type on a scale of 1 to 5. For more information, see KnowledgeArticleVoteStat. CaseArticle Object Represents the association between a Case and a KnowledgeArticle. FeedComment Object Represents a comment added to a feed by a user. FeedItem Object FeedItem represents an entry in the feed, such as changes in a record feed, including text posts, link posts, and content posts. KnowledgeArticle Object Gives access to an article independent of its version. This object is read–only and can’t be used in a SOQL clause or in a WITH DATA CATEGORY DataCategorySpec SOSL clause. KnowledgeArticleVersion Object Provides a global view of standard article fields across all article types depending on their version. KnowledgeArticleViewStat Object Provides statistics on the number of views for the specified article across all article types. KnowledgeArticleVoteStat Object Provides the weighted rating for the specified article on a scale of 1 to 5 across all article types. NewsFeed Object Represents a single feed item on a user’s home tab. A Chatter feed shows recent changes to records that the user is following. UserProfileFeed Object Represents a user profile feed, which tracks all actions by a user on records that can be tracked in a feed. This feed is displayed on the user profile page. This week I had to create a REST web service to expose some FAQ articles to an external web site. That is not a big deal because you only have to query the ArticleType__kav object. The only tricky part there is to include the Language and PublishStatus in the Where clause. Create an Article from Apex. After create the web service I had to create the Test Class (I really create it before ;)) I faced the problem to create the article from Apex. After spend some time googling what table should I insert the article and what order I figured out that it is really easy. I only needed insert the article in FAQ__kav and SFDC trigger the insertion of the rest related records. More about the publishing service here. This entry was posted in Apex Tip and tagged apex, knowledge base on 2014/05/17 by martin.